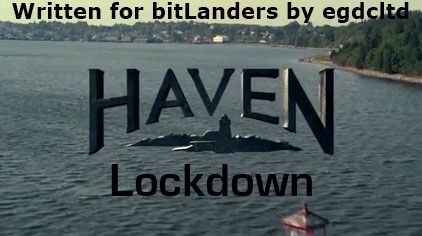 "Lockdown" is episode nine of season two of Haven, a supernatural drama series loosely based on Stephen King's The Colorado Kid. In this episode, the new chief of police quarantines the police station and things go downhill from there. In the previous episode, "Friend or Faux", a patsy of Reverend Driscoll's had manoeuvred Nathan out of being the chief of police. 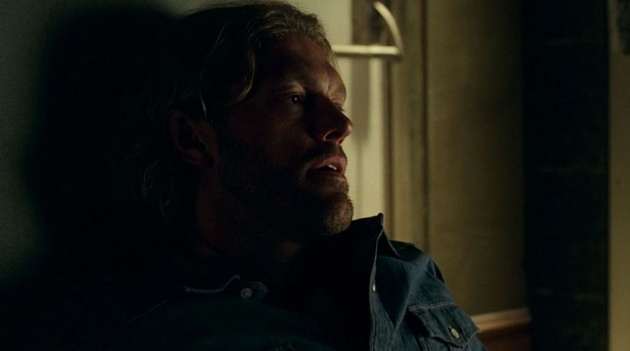 Duke had also found out that Evi was working with Driscoll. Which isn't likely to please him. Driscoll wanted Duke on his side; that now seems unlikely. Dwight - the man who cleans things up - has been arrested, under the orders of the new chief of police. Nathan lets him go again; he doesn't think the new chief - an outsider - has a clue what's going on. Meanwhile, in the station, the officer who arrested Dwight turns black, as he leaks black blood, and collapses - dead. Parker is concerned because it's going to be the first time she's seen Chris since he left for London at the end of "Audrey Parker's Day Off". Duke has come into the station to tell Nathan that Evi shopped Nathan's 'Troubled' file to the rev. The new chief thinks it's a terrorist attack, using a chemical weapon. Then Evi has the same symptoms, and he assumes it's a biological attack, possibly airborne, so quarantines the station. Yes, he's out of his depth. He also takes everyone's phones and weapons. Parker books a weapon into evidence just to be on the safe side. Nathan takes the dead cop's radio, and finds out that the State Police and CDC were both told that it was just a prank. The new chief has plans against the Troubled. Then he collapses and dies the same way. Evi claims that she thought she was helping Duke. They still can't leave, because there are armed guards outside who will only stand down on the orders of the, now dead, new chief.